This recent trip back to Iowa was to pick up equipment which had been on a job in Fort Madison since April. There was grave concern in the office that I wouldn't be able to get it. This was my job and I would have been upset if someone else had been told to go get these things. But I'm also aware that it has not been a good summer and fall for me walking, let alone hefting things into the Jeep. We need the equipment, however. We have a huge job upcoming and these machines need to be serviced and returned to our stock to go out again. The boxes in which the equipment is stored are just awkward to move. They aren't all that heavy. One of them is called a "cheese box", because it resembles a wedge of cheese. That one had to be picked up first so it could go in the back seat. The painted steel is slick and I had to remove my gloves to actually pick it up. 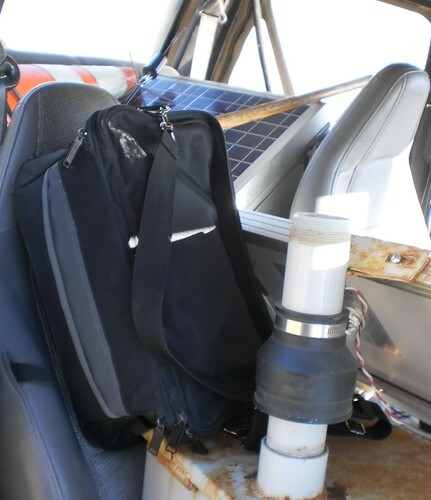 Once I got the small end of the box in the back seat, I could "roll" the box up onto the seat and slide it over behind the driver's seat. This is necessary because the passenger seat has to be reclined all the way back for the other box to ride there. The other box, made of the same kind of painted steel, is not heavy at all. The "cheese box" is heavier than this one. It's smaller, but the problem with it is the 4 foot by 1 foot solar panel affixed to the top. If getting the "cheese" box into the Jeep was awkward, this one is awkward x 2. We all carry a tool bag. In this bag are the things that help us install, service or remove equipment. I have gloves, glue sticks, a torch, screwdrivers and a hammer, among other things. 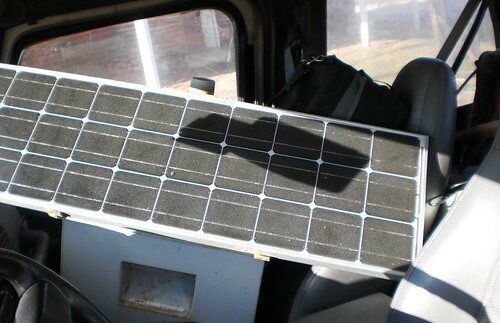 It was suggested that I could take the solar panel off the box and that would make it easier to move and stick in the car. Yes, yes it would IF I were smart enough to have an adjustable wrench in my tool bag. The solar panel is affixed with a nut and bolt combo, not large screws. Hence, getting it off the box wasn't going to happen. This box was located outside a small engine repair shop. I took everything out of the box, slid it over to the Jeep and went inside the building to ask for another pair of hands to lift it. The gal at the front desk looked at me and said, "There's no one here to help." Now, I could see, through the doorway behind her, two guys way in the back of the machine shop, but, since she seemed to be dismissing me, it was the better part of valor to just say, "Okay, thanks." and leave. I bent down, bent my knees and lifted. As I said, it's just awkward. It's not heavy. I got it into the Jeep but then couldn't get the door shut. I ran around to the passenger side, pushed, pulled, tugged and moved and then a guy came out of the back door of the building. "Sandy said you needed help moving your equipment?" he said. I looked at him and said, "I did, but I managed to figure it out on my own. Thanks for checking on me, though." "You sure you don't need help?" "No, I'm good. I got it." I ran back around to the passenger side, lifted and pushed just a bit and closed the door. On Monday, the guys are getting this stuff OUT of my car. I am not removing it. To answer your question, my knees were fine. Twice, I squatted to unlock the locks and my conscience yelled at me. "NO NO NO! Dr. Choi said no squatting!" I had no problems driving out there. That pain was non-existant. My right knee did hurt on the inside but that's gone now. My hands hurt quite a bit Friday and into Saturday morning, but they are better now too. I don't want to do this again until next spring, but I am quite proud of myself for being able to do this on my own.